I’ve been storing them in a magazine rack with my small but growing collection of vinyls. I didn’t want to part with them as I do intend to visit all the places advertised in them at some point but I wanted them tidier and more easily accessible. My solution? I added them to my ‘Places to Visit‘ board on Pinterest and recycled the physical ones. Simple, yes, but very effective and I feel much more organised. I also debated adding them to Word documents, pdfs or simply photos of them each kept on my laptop. If they’re places you’ve already visited you could add them to a scrap book or photo album(s). Very nice! 🙂 I usually throw mine away because I find a lot of my information online. My fiancé likes to buy books for certain regions or download e-books. 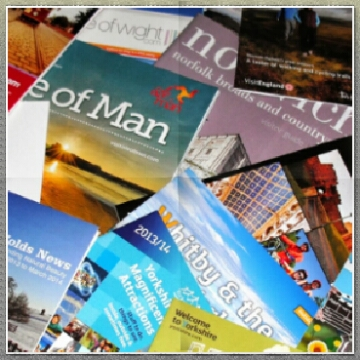 Travel guides can physically take up a lot of room so having a digital version can be useful. Every time I am done with a trip I usually get rid of all my brochures and things. I don’t feel like I need to keep them, I guess.